Our team, Catch A Falling Star, is a group of mental health advocates who believe in a better tomorrow for the millions of people who are diagnosed with treatable brain disorders (mental illness). 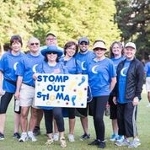 Catch A Falling Star is celebrating its tenth year with NAMIWalks. We are walking to raise awareness of mental illness, raise funds to support NAMI sponsored programs, and to eradicate the senseless stigma that has prevailed in society against brain disorders. All funds raised directly support the mission of NAMI Greater Houston to provide support, education, and advocacy to individuals and families right here in our Greater Houston community. Brain disorders are biological treatable illnesses that must be treated as such.